Mother Nature would rather have us perceive something as more dangerous than it is so we react promptly. Rationally dissecting every instance in which we feel threatened isn't always realistic, but it is possible to neutralize this cognitive distortion. In seventh grade, a classmate with whom I'd had very little interaction, Scott, walked up to my locker and offered me some unsolicited counsel. "If you ever want to get married," he spewed, "I would get rid of those Coke-bottle glasses and seriously consider some braces. Otherwise, no one will ever marry you." Deep down I knew this prediction was immature. Still, the words stung. It wasn't long before a regretful Scott offered myriad apologies. I even later learned that his cruelty was a dare which middle school politics made impossible to turn down. But the facts made no difference. The damage had been done. In spite of many wonderful school memories, over the years that moment of hurt -- that feeling of helplessness -- stands out. As adults, we still fall prey to ruminating on the negative. Envision a performance evaluation in which your boss profusely praises your superhero-like capabilities and then, at the very end, slips in one tiny suggestion for "development." Later, you replay the evaluation in your mind. All of the positive comments melt away and you're only able to focus on that one small request for improvement. Sound familiar? If you have a penchant for detecting and dwelling on the negative, it's no cause for alarm. In fact, you are simply a product of intelligent human design whereby bad overpowers good. That's right -- humans were designed to be keenly aware of negative circumstances and consequences as it helped our ancestors survive. Think about cavemen who went out gathering food for their families. Those who survived did so because they were sharply attuned to attacks from saber-toothed cats lurking in the bush. In modern times, we don't have a regular need to run from predators, yet what remains with us is an evolutionary imprint called the negativity bias. The negativity bias is a tendency to have greater sensitivity to negative than to positive events. Some researchers posit that, psychologically speaking, negative events weigh close to three times more than positive events. While this bias may serve us in situations related to survival, it can cause distress in everyday encounters. 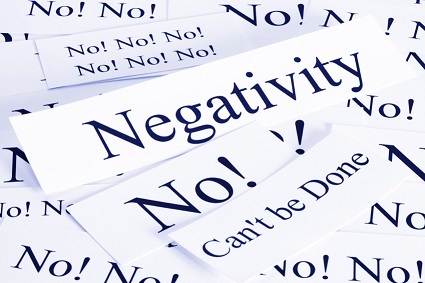 So the question becomes: How can we topple this negativity bias? 1. Savor the good stuff. Studies from the field of neuroscience indicate that, while negative events may be seared into your mind almost instantly, it takes 5 to 20 seconds to emotionally absorb positive events. When something positive happens in your life, stop and take several moments to bask in the joy of the event. Extend your positive experience with your senses; explore what you feel, hear, smell, touch, and see. 2. Express gratitude. Keep a gratitude journal and write down three good things every day that happened during the preceding 24-hour period. Writing down the good stuff can help you stay attuned to those things for longer periods of time. When something positive happens, celebrate! Give yourself permission to recognize the small victories of life, even when they seem mundane. 3. Tune out for a while. In the news business, they say, "If it bleeds, it leads," because negative events attract a greater audience. While it's great to stay informed, it is not necessary to consume negative news all the time. Try taking a 24- to 48-hour break from the news, stick to headlines only, or research some good, hopeful news to balance your intake of current events. 4. Make accurate judgments. Part and parcel of the negativity bias is overestimating threats. Mother Nature would rather have us perceive something as more dangerous than it is so we react promptly. Rationally dissecting every instance in which we feel threatened isn't always realistic, but it is possible to neutralize this cognitive distortion. Give yourself a few minutes to distance yourself from what happened, and try to remain accurate in your interpretation of challenging events. Whether it is a performance evaluation or disagreement with your spouse, gather all of the data points, negative and positive, before making a judgment. Try to incorporate some of these practices into your life regularly, and watch that negativity bias begin to topple! For more by Renee Jain, click here. 1. Baumeister, R. F., Bratslavsky, E., Finkenauer, C., & Vohs, K. D. (2001). Bad is stronger than good. Review of General Psychology, 5(4), 323-370. 2. Beck, A.T. (1976). Cognitive therapy and the emotional disorders. New York: International Universities Press. 3. Emmons, R. A., & McCullough, M. E. (2003). Counting blessings versus burdens: An experimental investigation of gratitude and subjective well being in daily life. Journal of Personality and Social Psychology, 84(2), 377-389. 4. Fredrickson, B. (2009). Positivity: Groundbreaking research reveals how to embrace the hidden strength of positive emotions, overcome negativity, and thrive. New York, NY, US: Crown Publishers/Random House. 5. Lewis, M. D. (2005). Self-organizing individual differences in brain development. Developmental Review, 25, 252-277.